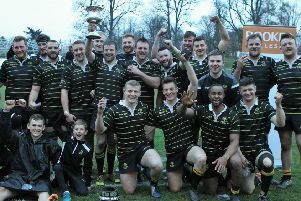 Promotion to Tennent’s East Region League 1 was secured with the Linden’s bonus-point win over Edinburgh Uni Medics, in trying conditions. Too many mistakes and wrong options meant it wasn’t their greatest performance but it was a case of ‘job done’. Having won 35-5 at Peffermill earlier in the season, it was exactly the same score line at the Volunteer. The previous win was based on scrum dominance – same again this time. And the match in Edinburgh saw Graham Colville touch down three times – as you were in the return match. The Linden missed an early penalty kick at goal. On 11 minutes, Kris Rowley’s kick ahead forced the Medics to concede a scrum five, which saw the Royal Blues drive their opponents back and Colville scored his first try of the day, with Kieran Murphy converting. Following a charge down, the students looked sure to score but the ball carrier went down on his way to the line, his heels possibly clipped by one of his own players. However, after recycling the ball, Medics eventually got over the line. Just after the half-hour mark, the Royal Blues again walked a scrum forward before Colville fed Euan Wood. When the scrum half was tackled just short of the line, it was Colville who picked up and drove over. Murphy slotted the conversion in off the upright and, with no further scoring, the first period ended with Linden 14-5 to the good. The full back sped up the stand side touch line and some lovely inter-passing with Craig Glendinning kept the move going, which ended with Stuart Hair up in support to finish off. Murphy added the extras again with the help of a post. In the last 10 minutes, the Linden finally began to find their rhythm and played with more fluency and accuracy. Another scrum drive enable d Colville to complete his hat-trick and his 16 th try of the season, with Murphy this time putting his kick straight between the sticks. Sandy Walker hit up from a scrum and Liam Sharkey carried further. Quick ball sent Kris Rowley racing to the line and he converted his own score. The match nearly ended with a fantastic try – a lovely break from Bell found Mallin at speed but his flat ball to Sharkey was adjudged forward. There was not the same intensity as the week before but a hugely satisfying outcome for the Royal Blues to win promotion. With Langholm losing at home to Trinity Accies, the Linden need one more victory to clinch the East 2 title, with their next match at Milntown in three weeks’ time. Hawick Linden: M. Bell, C. Glendinning, M. Mallin, G. Anderson, K. Murphy, K. Rowley, E. Wood; M. Boyle, P. Drysdale, S. Spalding, E. Hair, S. Hair, L. Stormont, J. Rowley, G. Colville. Subs: S. Donnelly, M. Parker, J. Wilson, L. Sharkey, G. Scott, S. Walker, K. Douglas.